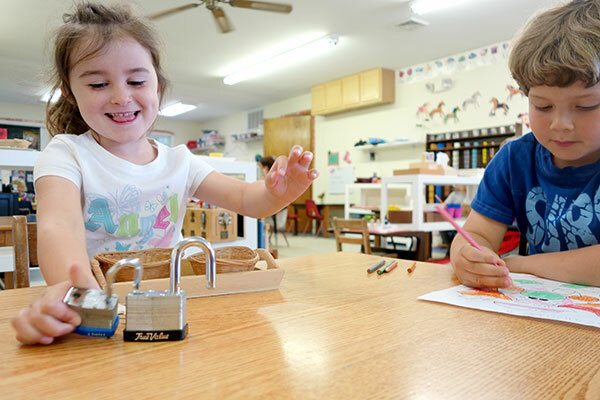 We believe that each child is an individual, which is why no two paths through Friendship Montessori are the same. Instead of a set curriculum, students are given time and space to follow their talents and interests, learning independently as well as one-on-one with teachers. In everything we do, we focus on educating the whole child to be a good friend and citizen in addition to a lifelong learner. Starting in Pre-Primary, FMS students begin to establish the building blocks of reading through works that introduce the fundamentals of spoken and written language. Sandpaper letters teach letterforms and sounds. Matching words and objects cements language comprehension. The movable alphabet lesson teaches spelling concepts. By the time children graduate from FMS at the end of kindergarten, most are confident early readers with approximately 15 memorized sight words, can count to thirty in Spanish, are able to copy from the board, and can write a story (with creative spelling). 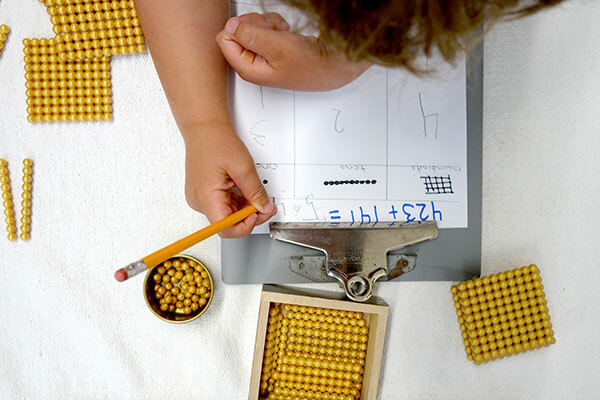 From their earliest days in our Pre-Primary classroom, students tackle math fundamentals—first through works that teach them basic numbers and counting, and then with materials meant to establish conceptual basics behind addition and subtraction. Teachers develop customized story problems, inserting the students’ names to help them anchor math concepts in a relevant context. By the time they leave FMS for first grade, most students are able to recognize numbers up to 1,000, do three‐digit addition and two‐digit subtraction, and know the names of many plane and three-dimensional shapes. For a few hours each morning, FMS students follow their curiosity by selecting among dozens of “works”—learning exercises designed to convey a variety of intellectual, practical, and constitutional skills. The first time a child does any given work, a teacher gives a one-on-one tutorial, explaining and observing to make sure the student grasps the fundamental concepts. Thereafter, most work is self-directed, the teachers offering help and guidance when needed, but otherwise letting students learn at their own speed and according to their own interests. 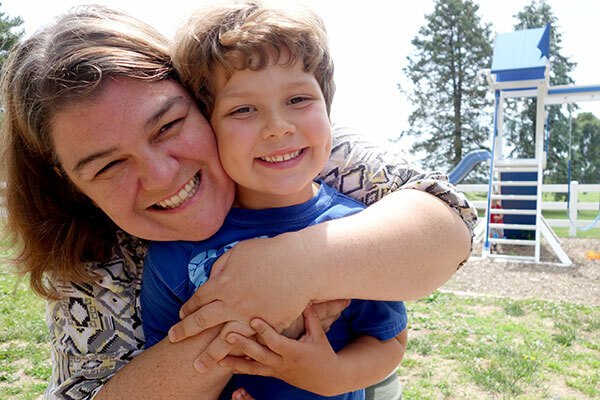 FMS proudly boasts a staff of five teachers with a collective 61 years experience in Montessori classrooms—led by School founder Holli Mathison, who has been Montessori-certified since 1984. All five teachers have college degrees, and all of their children have attended FMS. 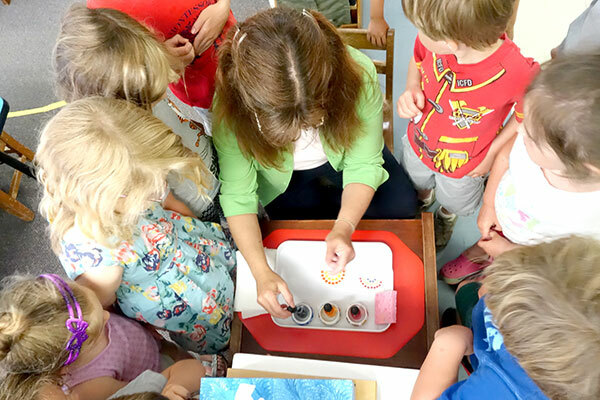 Our teachers elevate their lessons with a variety of personal skills and interests—including pottery, painting, nature, recycling, and rainbows. In the interest of providing the best possible experience for our students, we maintain a teacher-to-student ratio that far exceeds state requirements. FMS students learn with their hands. 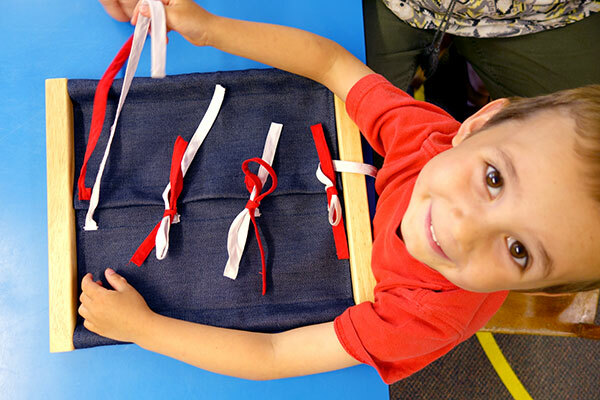 Whether fastening buttons, opening locks, sorting shapes, stacking blocks, grading colors, doing puzzles, pouring water, operating tongs, tying laces, planting flowers, raking leaves, or practicing the dozens of other life skills they encounter on a daily basis, Montessori children gain physical dexterity and mastery of their physical world at an early age–empowering themselves to confidently tackle activities which might elsewhere be done for them. Along they way, they also learn that spilling and breaking things is just part of life, another opportunity to learn. 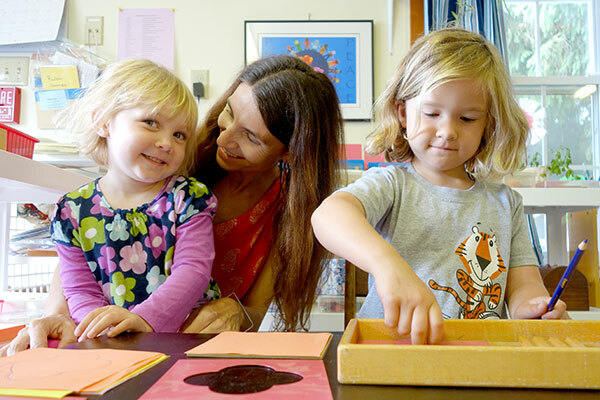 Central to Montessori learning is a deliberate mixing of children of various ages so that the older ones can help their younger classmates learn. Guiding and encouraging their peers allows older students to cement learning concepts while developing patience, kindness, leadership, teamwork, and self-confidence. At the same time, younger students benefit from positive peer role models and learn the value of asking for—and accepting—help. Our 2-3 year olds spend their days together in Pre-Primary while our 4-6 year-olds learn together in the Primary classroom. Both classrooms come together occasionally for celebrations and outdoor play. In addition to self-directed learning, each day at FMS offers a group gathering called Circle Time. Students sing and dance together, perform a series of daily check-ins on the date and weather, share personal stories and objects, and participate in hands-on lessons about history, science, art, and society. Topics range from Chinese New Year to outer space to Marc Chagall to Earth Day to the presidential election. Lessons include tactile elements—artifacts and photographs—and are often reinforced through related works and art projects. 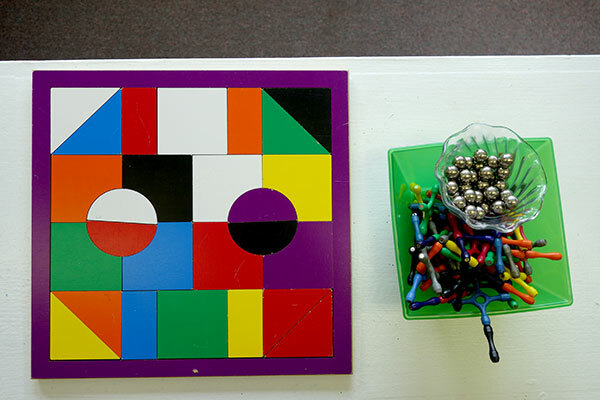 From strings of beads that represent numbers to metal stencils that teach shapes to sandpaper letters that aid in the learning of letter sounds, abstract principles are made concrete and accessible with the help of physical objects that serve as learning tools. Building on the idea that children learn best when their senses are engaged and inspired, teachers take great care to create works that are beautiful, drawing on natural objects and materials, whether glass beads, colored water, wooden blocks, soft feathers, or smooth stones.